Suzlon is among the most vertically integrated wind turbine makers in the world, with manufacturing capabilities for all key components of a wind turbine generator. 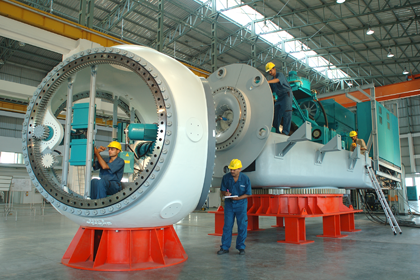 While a wind turbine consists of various components, Suzlon is one of the few players in the market that has manufacturing facilities for most components of a wind turbine. 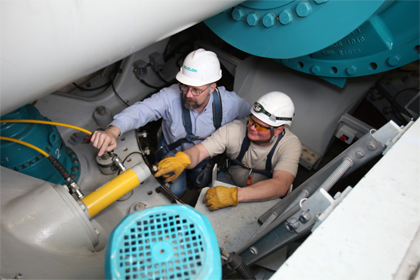 This ensures consistency and reliability of the turbine. With production facilities in India and China, Suzlon has the wherewithal to cater to global markets. 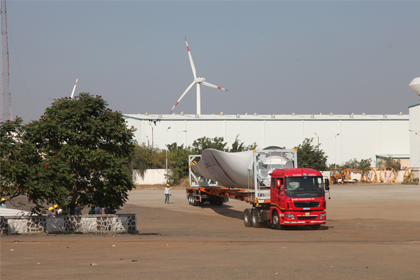 Suzlon ensures that it has manufacturing capabilities for almost all the constituents of a wind turbine in-house like blades, nacelles, control panels, hubs, and tubular towers. The company currently employs over 4,000 people worldwide with a capacity to manufacture 4,200 MW annually. Suzlon’s customers are assured of uniformity and reliability in quality due to the vertical integration of Suzlon’s manufacturing. Its state-of-the-art equipment combined with experienced technical resources ensures that the various components manufactured meet all standards of quality. Compliance with all standard technical and regulatory norms is adhered to during the manufacturing process. Suzlon’s strength in manufacturing is one of the reasons why it is the number one player in the wind energy sector with the highest number of installed wind assets in the country. 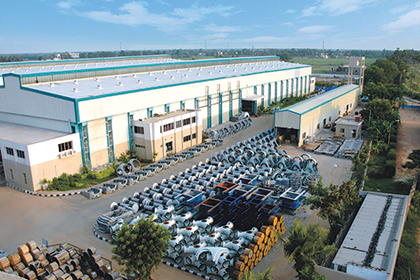 Suzlon’s integrated manufacturing strategy is ably supported by its efficient supply chain management processes. Suzlon’s supply chain management is a robust system of independent functions working together in an interrelated process. This ensures that the process functions independently of any particular aspect of the operation. Each function complements the other and hence proves to be an advantage as timelines of service delivery are always fulfilled. 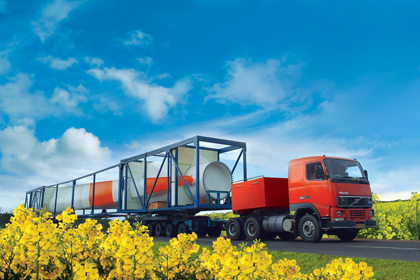 There is no time lag due to delay in delivery by a particular function, which ensures profitability for the customer. The functions of the supply chain are either carried out in-house or outsourced to vendors. Suzlon aims at consistency in practices and quality in products, both of which are ensured through a rigorous vendor development process. All vendors and subsidiaries are required to meet the quality standards, strategic goals and vision of the organisation. They are carefully screened and analysed on numerous criteria related to materials, processes, quality and environment by a dedicated unit that comprises members of senior management, among other experts. Suzlon’s supply chain management process contributes towards helping the customers earn profits in a sustainable manner while promoting a green environment.